Governor Nyesom Wike of River State has said that he will ensure that former vice president Atiku Abubakar emerges victorious in next year's election. Atiku emerged as the presidential candidate of the People's Democratic Party (PDP) at the party's primaries which held in Port Harcourt, the Rivers State Capital. 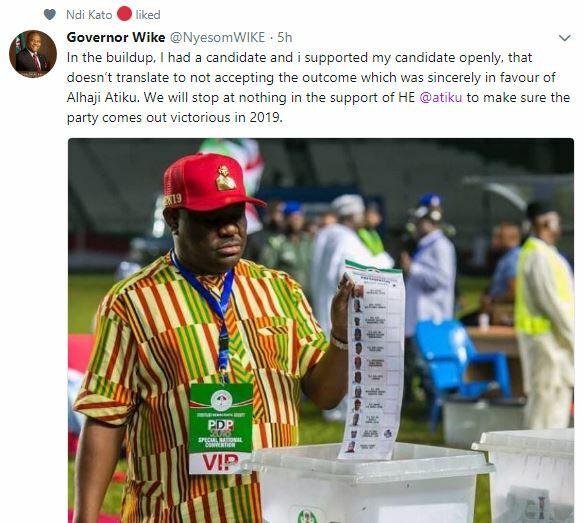 Wiki who backed Sokoto State governor Aminu Tambuwal against Atiku in the primary election, so stated in a tweet that he has accepted the outcome of the election. He further pledged his support for Atiku's stating that he will stop at nothing to make the party emerged victorious in 2019. His tweet puts to sleep the rumors going on at the party's presidential ticket.